Meet other progressive women of color and allies who are currently elected officials, exploring a potential run or who are engaged in electoral campaigning. 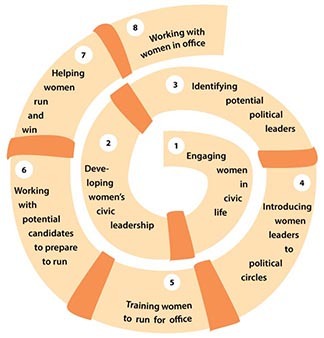 Organizations and individuals give women leaders interested in politics access to networks of progressive political actors and connect them and their team with ongoing political campaigns. AAWPI’s State House Fellowship Program introduces its participants to political circles both through the formal training and internship as well as through informal political and networking opportunities. CPPA introduces the women to political circles by linking issue campaigns to the legislative process to win progressive demands such as bilingual ballots, increases in minimum wage, etc. Emerge Massachusetts introduces the women in its 6-month training program to political circles through networking receptions, trainers who are political professionals and elected officials, and by matching each participant with an elected woman as a mentor. Mass Alliance connects activists and participants in its training to great grassroots campaigns and efforts happening in every cycle. MWPC connects women to political circles through many networking events, including its Commonwealth Commentary Series and its Young Professionals Group. Neighbor to Neighbor Massachusetts introduces women to political circles by connecting them with its wide network of allies, including labor unions, issue advocacy groups, and progressive legislators. ¿Oiste? introduces women to political circles through its training Latinas Por el Cambio and Despierta.